A couple of years ago, I blogged about the issue of nickel allergies and watches, as the problem is one that affects one of my sisters. And so it was with great interest that I read about Hanhart introducing a new nickel-free stainless steel alloy for their mechanical chronographs, called HDSPro®. 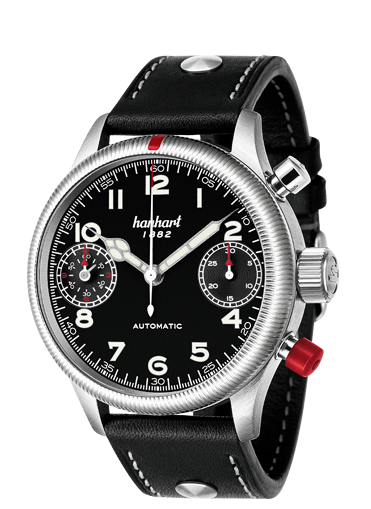 Hanhart state that they are the only watch brand in the world to use this steel, which has been treated to harden, in the manner of the tegimented steel used by Sinn, but to a lesser Vickers than Sinn. The brand’s focus is on tool watches for the air, land and sea, as they put it, and thus, they have an interest in utilising tough, hard-wearing materials for their watches. HDS steel will give the watch case a surface structure that at least three times harder than previously (600-700 Vickers), and which is also more scratch resistant, and more corrosion resistant. As I mentioned at the outset, this steel does not contain any nickel, so watch cases made from this material will be good for those with allergy problems, giving them a broader range of watches apart from titanium and ceramic, from which they can choose. My personal hope is that more watch brands will acknowledge this issue and consider more widespread use of titanium, ceramic, or an alloy such as this and that for women like my sister who have small wrists and/ or don’t like wearing men’s watches, they’ll not forget about women’s watches, either. The first Hanhart watches with cases made from scratch-resistant and nickel free HDSPro® stainless steel are due to be launched this year. According to a post by SJX, Hanhart is not the first company to use this alloy, with some small online brands also using it, but it sounds as though they are the first mainstream brand to do so.